We’re really excited about the awesome fashion we’re seeing at shows , not just because a lot of it has been MBD couture but because fans and dancers have been so creative in their raqswear. We want to join in the idea of keeping it colourful with our own array of gorgeous hip scarves and accessories. Make your outfits pop with just the right veil, coinbelt, fans and more. Our fan veils are a great way to bring attention to our set and demonstrate your skills. They flow beautifully and look amazing at festivals and in group sets. There are many different colours from which to choose. Bold, bright and billowing in the wind, this is what you want in your raqs parade with your troupe. Veils are known to create a grand entrance for a performance. Though traditionally they are tossed quickly after one enters, it should be a first highlight for your set. Bring the eyes to the stage with a big, popping colour and then let your passion and technique take over from there. Once that veil is dropped, revealing you in all your awesomeness, shine like a diamond with an amazing costume accompanied by a jewelry set. Your shimmies will never be forgotten if they are adorned with coins and jewels and your wrists shimmering under stage lights. So keep it colourful and bright this summer! And send us pictures to get entered to win a prize. Looking forward to seeing you shine! Our Tips for the week – learn a variety of raqs genres and sister dances. Know the history of the dance and where it is going. Embrace diversity in dance. Our industry has evolved continuously. These days dancers want to wear their craft daily. Fans are eager to show their support for the art of Raqs Sharqi as well as the region’s couture. We’re offering several options that meet that criteria for our customers. 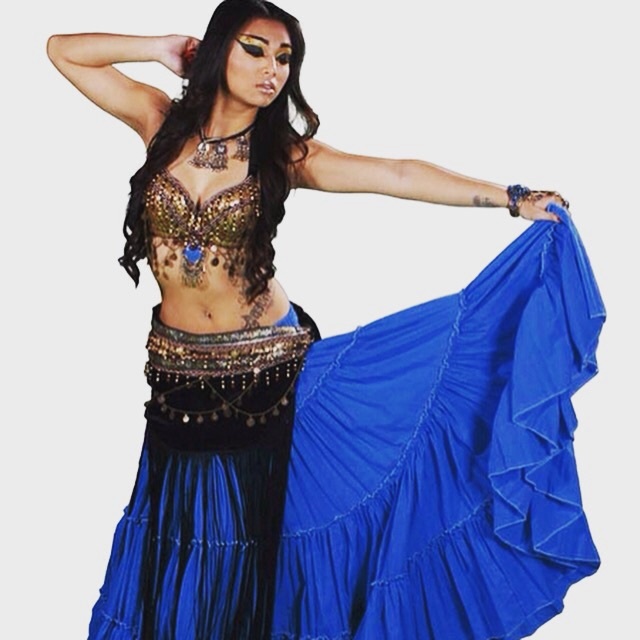 Raqs Wear has become all the rage in Raqs Sharqi circles and communities world wide. All genres are represented in these everyday styles. Ours are made of a flexible material that meets the needs of the diverse community of dancers seeking out something stylish for everyday. From wrap waist tops, to flirty, swirly skirts, our website features several raqs wear items and skirts that are sure the please. They are also thin enough to be worn in the blazing summer heat. So, go out sizzlin in these sleek and stylisth ensembles. Tell us which ones are your favourites on our FB wall and Instragram uploads and you could be our next winner. We’re giving away prizes next month. Join the conversation online and up your chance at winning. We’ve often talked about how grateful we are to be in Atlanta where the Raqs shows are plentiful. Just about every weekend we get treated to the most amazing performances around the city in a variety of communities. This coming weekend is the annual show hosted by Amani Jabril of Amani Jabril Middle Eastern and World Dance. This year we’ll see the return of Rosa Noreen and Jonatan Derbaq who graced the stages in 2014 with some pretty amazing material. This year, there’s guaranteed to be even more splendid spectacular with a line up featuring many of Atlanta’s best raissat and crowd pleasers. One of the highlights will be seeing Amani Jabril LIVE. Her award winning dances and teaching styles are known internationally and it’s an honour to have her based out of Atlanta. As mentioned by Zaghareet, this city is filled with hidden gems and excitement. Amani and her friends sparkle at every show, gaining global fans and stealing hearts in the international community. She and her raqs colleagues do not disappoint. The show begins at 9pm on Saturday June 6th at Steve’s Live Music in Sandy Springs just north of Buckhead, Atlanta. Parking is free and the bar will be open all night. Steve’s not only has great music but a cool menu of savoury treats for attendees. You can get comfy and bring a friend for all of his fantastic shows. We hope to see you Saturday for this annual extravaganza of shimmering Raqs Sharqi.